We are fully committed to bring quality in the way you work in your kitchen. With our exclusive range of Electric / Manual Juicers, we make extracting juices from different citrus fruits, vegetables and more an easy affair. You can use them for juicing lemons, oranges, limes, and grapefruits for preparing fresh juices. These appliances save a lot of your valuable time and effort, and provide you with a high quality output. 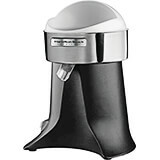 Our citrus juicers and vegetable juicers come in two broad categories - Electric and Manual. 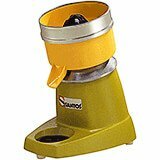 By applying calculated pressure, our manual juicers allow you to extract maximum citrus juice from fruits by a simple hand action. Electric juicers let you finish the work efficiently without putting in much effort. 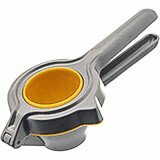 Made from the best grade materials these citrus juicers are destined to serve you for years to come, and they are amazingly easy to clean too. Made of cast aluminum. Epoxy coated. Dishwasher safe. Weight: 1 lb. 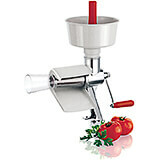 The Paderno World Cuisine manual tomato press separates skin and seeds to only release the juice of the tomato pulp. The 8-1/4" by 4" hopper feeds a drum. When cranked, leavings and liquid are directed toward different chutes. The body and moving parts are made of stainless steel with removable plastic hoppers. 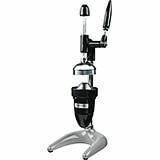 FEATURES: Heavy Duty 18/10 Stainless Steel. To Extract The Flavorful Juice Of All Your Citrus Fruits. Comes With Bowl That Fits Underneath. 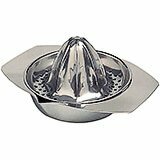 Perforated Juicer Cone. Weight: 8 oz. .